05:30:00 Makes 16 servings, 1 piece (88 g) each. Three words - chocolate, caramel, cheesecake. 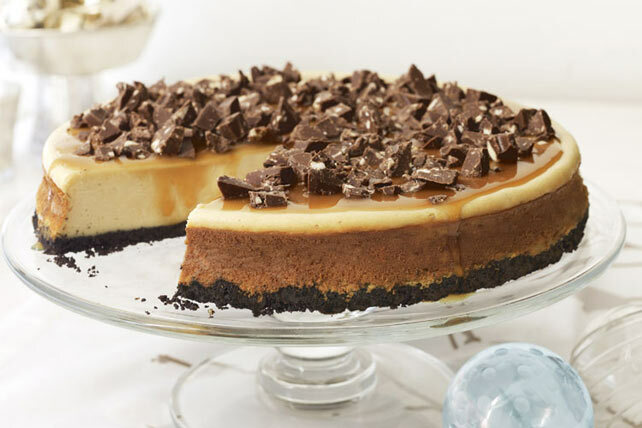 Our Chocolate-Topped Caramel Cheesecake has it all, including a chocolate cookie crumb crust. How's that for a festive cheesecake? Prepare using Philadelphia Light Brick Cream Cheese Spread. Prepare as directed, substituting 13x9-inch pan for the 9-inch springform, decreasing oven temperature to 325ºF and decreasing baking time to 28 to 30 or until centre is almost set. Cool completely in pan. Top as directed. Serving Size Makes 16 servings, 1 piece (88 g) each.